As you may have already seen in a previous post, our VW CC is yet again on a new set of rollers and we have no need to keep an “extra” set of Summer shoes in storage. Up for sale (edit: SOLD!) 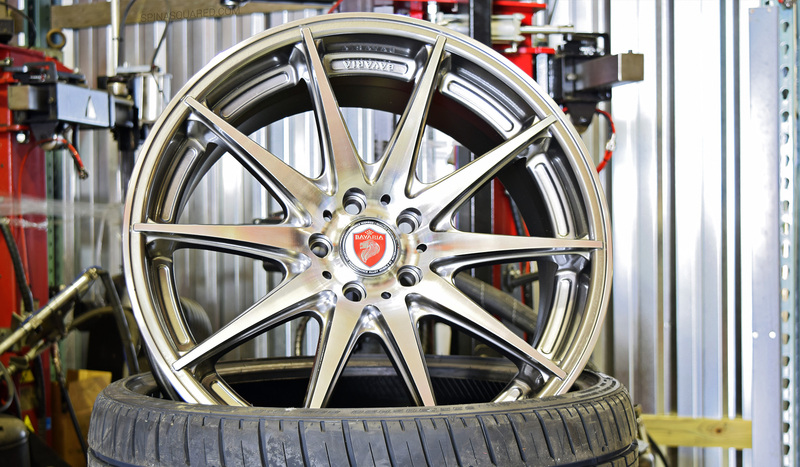 is a set of 4 5×112, 20×8.5 Bavaria BC-10 wheels in a hyper-silver/machined finish. Two are a +42mm offset, the other two are a +25mm offset. The staggered offsets eliminate any need to run wheel spacers. Three wheels are in perfect condition, one has a couple of small “dings” on the face of the wheel which can easily be fixed if the imperfections bother you. The tires are 235/30-20 Falken PT-722 all-seasons with 98% tread life left. Click any image below to see a larger version of it. We’re asking $1100. Contact us if you are interested!